I first of all thanks Indiblogger organisers and staff for giving me the opportunity and forum to write on a very interesting topic 'WINNING' for India Today Conclave 2014. Indiblogger basically is my teacher as number of my fellow bloggers and internet savvy readers and writers give lot of suggestions not only for improvement but also impart lot of learning from their experiences written in their blogs in the Indiblogger. All of you who will be attending this august and humble gathering and who will be meeting on March 7th & 8th 2104 in this wonderful and esteemed India Today Conclave in New Delhi and my fellow bloggers and thousand of internet readers based all over India and all over the world, I am sure you all have served the humanity in one way or the other through different ways and means individually and also with the help of your family members, your friends, your relatives, through different NGOs and also through your respective professional fields, as you all are continuous and constant Winners of your respective fields and number one and second to none in your professional fields. When all of you were on your way to this conclave you all had sufficient, bellyful of meal in the form of breakfast, either heavy in the form of stuffed Punjabi paranthas or light breakfast in the form of oats, poha ,upma etc. You all can seldom remember any day in your lives when even in a extreme hurry to board your flights you have left your homes without having any breakfast . As your spouse must have taken care of that aspect, even if she /he is not around or gone on her/his professional tour. But she/he will keep on following you on cell to make sure that you must have your breakfast before you leave for your professional work from your home. I even do not remember even any single day during my school days, college days or even otherwise when I have left my home in the morning without having any breakfast which was sometimes thrusted in my mouth by my loving and caring mother or father or my elder sister or my elder brother or by my bhabhi, sometime when I was getting ready or sometime I was about to leave. But one thing I watched very keenly and continuously observed since my childhood roughly for more than forty years that my grandmothers (both Dadi and Nani- paternal grandmother and maternal grandmother) always took out and separated and kept aside roughly ten percent or more of the food they are eating before they start their meals every day without fail, may it be a breakfast, may it be a lunch, may it be a evening snacks or may it be a dinner always without fail to serve it to the maids, sweepers or other house hold servants who were visiting to do different household chores. In the event of religious fast than the same quantity of ten percent out of the fasting food or more will be given to all them i.e. maids, sweepers or other house hold servants first. And in case they i.e. maids, sweepers or other house hold servants are on leave than I remember very clearly that it was our duty to go out with that ten percent or more, food to distribute it in temples or any of the religious places, to the beggars and especially to the small children sitting there. Why ten percent or more of sharing of food initially I was not able to comprehend but than the reason given by my elders i.e. Dadi and Nani that it is the religious guidelines in every religion, to serve minimum this much or more of the food we eat, to the poor and hungry so that nobody around your house or locality sleeps empty stomach in night. It is there in any religion or not I do not know. But it is a age tested formula by our elders to wipe out the hunger from this beautiful world of Almighty GOD by serving your share of food to the hungry, starved and deprived. I have neither seen nor I have met Almighty GOD till date. But the smile which you will see and watch on their faces of these hungry starved and deprived children, even when you will serve them only a boiling cup of tea with lot of sugar in it , in this icy and chilly winter, will give you a feeling of Almighty GOD standing before you. I get highly perturbed when at 5AM in the cold and chilly morning of Delhi , the capital city of India , when because of shivering and biting cold we all are snuggled up in our blankets , and with scanty clothing small children rag pickers from the age group of 5 to 10-12 years old not even wearing any shoes totally bare foot along with some elders are in garbage dumps full of filth ,oozing unbearable and intolerable foul smell, sorting out some eatables, some plastic material which they can sell to earn their breakfast. Because neither there was anybody to give them any breakfast nor they had anything to eat before they left their jhuggis at 5AM, if any jhuggis at all they have. Otherwise the open sky is their roof and the plastic which they rap around their body is their blanket. You will find number of them in and around the various religious places in Delhi, sometimes in and around your locality. These small starved and deprived children are always hungry. Their stomach is used to the painful hunger cramps. Have any of us has ever faced painful hunger cramps in our stomach. The answer I know is a big NO. And I sincerely prey to Almighty GOD never ever anybody in this beautiful world suffer from this extremely painful hunger cramps in stomach because of hunger and starvation!!!!! Than what all we should plan and implement when we reach our homes from this conclave. My winning stroke in this conclave will be that when all of us, on reaching back our home from wherever and whichever part of India or World we have come from, take out ten percent or more out of our breakfast, our lunch and our dinner daily and distribute to these hungry, starved and deprived children in and around your locality or find out nearby where they are. You will find number of them, daily without fail. First and foremost if possible involve yourself personally in this task and you will feel the peace, joy and satisfaction you get out of it. Otherwise If you are too busy than please assign somebody this duty daily under the eagle eyes of your elders in your home. And even if the elders are not their please do not hesitate to perform this task without fail every day and day after day. Further convey this age old formula tested and tried by our elders i.e. Dadis and Nanis ( paternal grandmother and maternal grandmother ) to eradicate hunger and provide food to the deprived and starved children in and around your locality, to your friends, to your relatives and to your family members, of ten percent distribution of share of your meals to the hungry children deprived of food. It will be a great Winning stroke for me in this conclave. UPDATE: I thank all the bloggers for reading and following my blog by sparing your valuable time. And giving your wonderful and amazing comments. From now I swear I would never waste food any more...I truly agree that the smile which you can bring in those innocent hunger stricken faces brings you eternal happiness...Inspiring article. after all..serving humanity is nothing but serving GOD. Thanks for supporting me in spreading the word to eradicate hunger from this beautiful planet earth. As Simone Weil said "It is an eternal obligation toward the human being not to let anybody suffer from hunger when one has a chance of coming to their assistance"
Thanks for instilling me with your appreciation. As said by Aristophanes "Hunger knows no friend but its feeder." So let all of us feed the hungry children. very sweetly written and I loved that you chose to bring that issue. Thanks for motivating me with your inspiring words. Let us all together uproot this epidemic of hunger from this world. 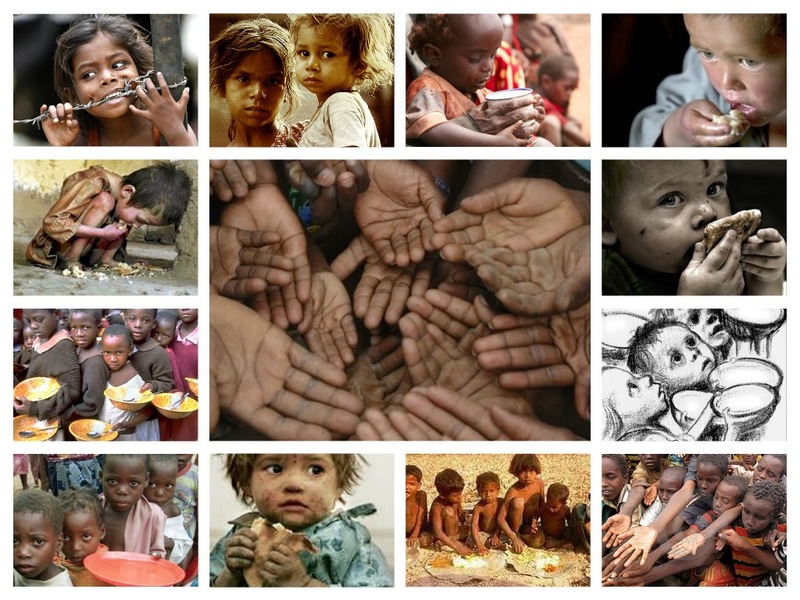 The biggest shame for any nation is where the kids faces hunger .But we all can demolish the hunger. Rightly focused on this issue. Malnutrition & starvation is seen in the less-privileged & your suggestion should help. Reading your Post reminded me of my family where the same policy has always been there and has been passed to me too. That's how we learn. Winning is when we succeed in creating a better Planet. If we take responsibility for ourself , we will develop a hunger to eradicate hunger from this beautiful, lovely and dazzling world. Start sharing with the hungry kids and propagate it. Thanks for giving very impressive comments. IF our olders genration specially ladyies can distribute food to needy ones,even to local dogs,cats etc without expecting any favour from them,why shall we can not continue this good habit & show that Anna Daan is mahadan.thanks for sharing your good concern. It is really good to feel that you are equating all the living creatures and living beings alike and every living being in this beautiful world should not be left hungry , deprived and starved. As it is very well said "An empty stomach makes human being a fierce dog." Thanks for your noble guidance and enlightenment. Your words full of appreciation gives lot of encouragement to me to continue feeding the hungry children and propagate this humble cause so that all of us keep on feeding the hungry children. Thanks for inspiring me. A very thought provoking post and im sure it will definitely make the readers more committed to this noteworthy cause...yes I agree we should not waste even a single morsel of food. Thanks for your immensely invigorative comments which will arouse the urge in all of us to wipe out the hunger especially in these small children from this our charming planet earth. It is very well said "A man who dares to waste a single morsel of food has never understood the value of food." Thanks for your highly energising comments which will further instill in me a lot of enthusiasm to serve these deprived and hungry street children. A message worth to be conveyed doesn't need fancy words or lines. This write-up of yours proves it. This particular idea of serving needy is amazing, and I will try to spread it as much as possible. I am unable to comment here using my WordPress account. Do you have any idea why is it so? Aditi thanks for reading my blog out of your busy schedule and responding to my blog.Your support is highly motivating, inspiring, stimulating.You must be knowing as per the figures available, in India alone 3000 children die every day because of hunger and 7000 adult Indian die of hunger and malnutrition.I am moved by your efforts to spread this movement to Banish the Hunger.